In writing a blog about using modern technology, you'd hardly think that I would include an article about a regular, old-fashioned magazine. However, Celebrations Magazine is not an ordinary periodical. It is a must have for any true fan of Walt Disney World. Although I have many friends and family members who enjoy reading or hearing about the vacation kingdom, many of them (the folks who can remember any decade prior to the 1970s) don't have an interest in modern technology. They think a cell phone should be used just for making phone calls and they prefer a note pad over an iPad. If you fall into this category, or just like the idea of reading something "printed" on a page, Celebrations Magazine is the perfect way to stay connected to Walt Disney World. Anyone who follows the Disney online community or has been reading this blog knows the name Lou Mongello. 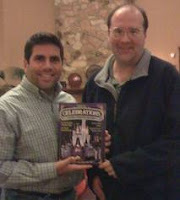 He is an author, podcaster, tour guide and a true authority on all things related to Disney theme parks. He partnered up with Tim Foster, another author Disney World author, to create Celebrations Magazine. It has been published for about three years now and a new issue comes out every two months. It is a high quality publication in every way. Lou and Tim have enlisted the help of several well known Disney historians who contribute articles on a regular basis. In addition to being the editors, Lou and Tim also write their own articles for Celebrations. Each issue is packed with interesting Walt Disney World news, stories and reviews. There are articles about the history of attractions as well as plans for the future. You can read about the different resorts and there is even a section for kids. When I talk about quality, I am also referring to the actual paper that this magazine is printed on. It is produce on heavy, glossy stock and each issue is full of vibrant, full color photographs. These guys don't skimp on quantity either. Each Celebrations Magazine contains over 80 pages! Even if you are a big fan of technology, I highly recommend subscribing to Celebrations Magazine. It complements the podcasts, blogs, and smartphone apps that high tech Disney fans have grown to love. For those of you who aren't into all the new fangled gadgets that the 21st century has to offer, this magazine stands on its own as a great way to get your Disney fix. You can get a year's subscription for only $29.99, which is 15% off the cover price of $5.99 per issue. You can also order a good majority of the back issues. To subscribe, head over to http://www.celebrationspress.com/. My subscription has become an annual father's day gift from my loving wife, and I look forward to each and every issue. Have a Disneyriffic day and keep moving forward. See ya real soon! Thank you for the post and for subscribing to the magazine, Dave! Glad you're enjoying it, and look forward to meeting you in WDW someday!